First things first, there aren’t drastic changes on how the facelifted S-Cross looks especially from the side and rear profile. However, as is with every facelift, more updates are on the front. The front fascia of the new Maruti S-Cross comes across as something fresh. Changes are in the form of a vertically stacked chrome grille, redesigned headlamps with LED DRLs and a redesigned bumper that’s sportier. The headlamps are LED projector units. Get behind the wheel and the familiar feeling is back; with everything, from the steering to the power window switchgear and wing mirrors, been seen on existing Maruti models. So much for doing away with the badging. They should have kept the badges and done away with the aggressive parts-sharing instead.The upside being that there’s none of the ‘unknown-car’ feeling. You quickly get comfortable in the large seats; even as you notice the lack of electric controls for the adjustments. The cabin on the whole is nice and airy. There’s enough space for four reasonably sized adults and are a marked improvement from the rest of the Maruti line-up. They’ve even managed to stay away from the temptation to go beige on the interiors and stuck to the European appeal, all black with silver accents instead.There’s touch-screen controls for the central entertainment system, that’s on-par for the segment and we’ll come back to the actual performance later. Build-quality though, continued to underwhelming, with small squeaks and rattles starting to develop even before the day had ended. The door-pads rang hollow when subjected to the ‘knuckle-rap’ test and the power-window buttons looked like they’d start to rattle in their spot, in no time.Fit and finish too could be improved on the S-Cross, particularly on the inside where the gaps between different panels is particularly inconsistent. Maruti will carry forward the same 1.3 Litre Fiat Multijet diesel unit and the 1.6 Litre DDiS diesel under the hood. The 1.3 Litre engine is capable of producing about 89 Bhp of peak power and 200 Nm of torque. While the more powerful 1.6 Litre unit is capable of producing about 118 Bhp of peak power and 320 Nm of torque. The smaller diesel unit is paired to a 5 speed manual transmission whiole the 1.6 Litre unit is paired to a 6 speed manual transmission. There is a fair chance that Maruti might also introduce a petrol variant of the Crossover as well. The petrol variant will most probably get the 1.5 Litre petrol unit which is capable of producing about 100 Bhp of peak power and aro0und 133 Nm of peak torque. This engine if introduced will be paired to a 5 speed manual gearbox. For the international market the same Crossover is offered with 1.0 Litre, three cylinder Boosterjet unit and a 1.4 Litre, four cylinder unit. The engine is available with a 6 speed manual or an automatic transmission. The bigger engine amongst the two gets Suzuki’s ALLGRIP AWD technology as well. The diesel variant gets the same 1.6 Litre unit which is also available with the Indian spec Crossover as well. The S-Cross has a well-judged suspension set-up. Ride comfort is good, with a supple and planted feel that absorbs all but the nastier potholes in the road. Factor in the generous ground clearance, and the S-Cross can handle broken roads without stress. High-speed behaviour is excellent as well, and the car feels planted at triple-digit speeds through flowing corners. We didn’t get to test the outright fun factor on a tight mountain road, but the S-Cross impresses with how it balances comfort and dynamics. Tyre size has risen from 205/60 R16 to 215/60 R16 and the new JK UX Royales are a big improvement over the previous JK Elanzos as they offer quieter performance and good grip. However, the tyre’s stiff sidewalls do result in a stiff-kneed ride at low speeds. Steering feel is typical of most new-age Marutis and there’s a decent amount of weight, but with a slightly light and vague feeling at the centre. Disc brakes all-round offer secure performance, but we’d have liked stronger bite in the initial pedal travel. The crossover comes equipped with disc brakes at the front and rear wheels, providing firm stopping power. To further bolster the stopping power, Maruti has fitted anti-lock-braking system, EBD and ISOFIX and two airbags as standard across all variants. Other safety features you get with the car include central locking, anti-theft security system and reverse parking sensor with display among a few others. 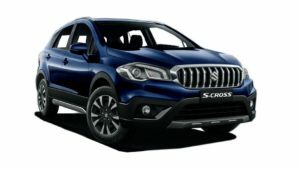 The S-Cross is a big step for Maruti Suzuki and the company is pushing its retail strategy to the next level by showcasing the new premium crossover only in its NEXA showrooms. These showrooms are being set up even as we go to print and are expected to redefine car retailing. So you may need to head to a NEXA showroom or ask to be chauffered to one to place your order.